When thinking about collecting wine and making a solid investment the purchaser needs to think about a few key points to determine their goals and which wines actually merit the investment they are looking for. Are you investing in the wine merely as a personal investment to be consumed over time with family or friends? Or are you interested in investment in wine in terms of creating a liquid asset in the future after short or long term storage? *Bold Italian Red - Italian reds such as Barolo, Barbaresco, Brunello di Montalcino, and other Sangiovese based wines or Super Tuscans are fascinating wines to enjoy with food. They have a unique flavor profile and tend to age very nicely. *Burgundy - Burgundy usually hits it's stride within 5-10 years but is very ageworthy because of it's high acid profile. These are lighter reds that will provide a nice change in pace and can accompany early lighter courses when enjoying them with food. *California Cabernet - California Cabernet Sauvignon is also a great contrast to the wines from Bordeaux. These wines do age well if you pick quality producers with sound reputations for ageable wine and they are generally more generous with their fruit profile. I have tasted side by side 30+ year old wines from Bordeaux and from California and have many times chosen the California wine as my favorite. Investing in wine for the short term or flipping wine is a practice many enthusiasts partake in to fund their wine drinking habits. I have turned a buck or two this way and have taken my profits back to the wine shop to buy cases of quality everyday wine for myself to enjoy over a longer period of time. Here are a few things to look for and some strategy for you not to get burned. *Know what your searching for - In order to flip wine you will have to keep your eyes open for opportunities when your in retail shops or searching online for deals. Have apps on your phone to search and know which wines have big press behind them and are selling on auction for exorbitant prices above retail markup. *Getting on mailing lists - This is a classic method to flipping wine for a profit. If you're savvy enough to get on a mailing list of a California "cult" producer who is getting all the press and high scores, you can buy your allocation and sell it the next day for profit. This technique of course requires a bit of luck and patience. *Search for the Scalp - Knowing your prices is key. You must find out what wines are currently auctioning for. Once you do, you can go searching all around town in every wine shop, liquor store, or cost co. in town. I once found five bottles of older vintage Dom Perignon at a Circle K selling for about a fifth of the actual value. I bought them and sold them on auction the very next week and more than doubled my profit. *1st Growth Bordeaux - This is the most obvious choice. Creating verticals and horizontals of these five wines is essential for long term investing. Be aware of your entry price though, and watch the press carefully and pay attention to vintage and how it affects the cost of entry. *Other Classified and Right Bank Bordeaux - There are other Bordeaux vineyards besides the first growths that are worth the investment for your collection. Search the press ratings for the other right bank classified cru's (especially the "super seconds") and find the vineyards that had particularly good growing seasons and good barrel sample tastings. *California Cult Classics - Harlan, Screaming Eagle, Bryant Family, Colgin, Bond, Phelps Insignia, Shafer Hillside Select, Araujo, and any other wines that score close to 100 points by Robert Parker and Wine Spectator. Also, the winner of the Wine Spectator wine of the year can also gain in value in the long term and almost assuredly on the short term investment flip. *Top Italian Wines - I stress on the word "TOP" because not all Italian wines garner the kind of attention that makes them appreciate in the long term. Super Tuscans such as Tignanello, Sassicaia, Ornellaia, Masseto, and a few others are sure bets if purchased at the right price points. Certain Brunello di Montalcino producers hold their values but won't necessarily be huge gainers. 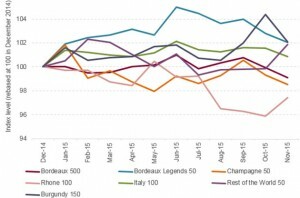 The same goes for Barolo and Barbaresco....These wine age beautifully and definitely improve over time, but the market isn't always super strong for them on the auction block. *Grand Cru Burgundy - This is a tricky category to invest in because of the vintage variation that is so common in Burgundy. When investing, stay with the most famous collector producers. These include Domaine de la Romannee Conti, Domaine Leflaive, Domaine Raveneau, Domaine Coche-Dury, and a few others. Also certain Grand Cru vineyard sites such as Le Montrachet, Richebourg, Clos Vougeot, Batard Montrachet, Chevalier Montrachet, Corton, and a few others are good to collect in stellar vintages from various producers. These are just a few different tips and lessons to think about when planning on investing your money in wine. If you're a wise collector you can fulfill your ambitions, whether they are to just have an amazing wine cellar to drink from, make a quick turn of the dollar, or invest heavily for a long term return, following basic principles and doing your homework will help you succeed.